There are many different methods and techniques for monitoring distributed systems. Most people do not explicitly state what type of monitoring they desire or employ. This leads to misunderstanding and miscommunication. This article presents some of the monitoring types that I have encountered. It gives them a name and discusses their characteristics. I hope that you will find these names useful to get a clearer understanding of what you and the people around you talk about when they say the word “monitoring”. Before we look at the various types of monitoring, let us define some categories for the monitoring types. There are three basic categories of monitoring; technical monitoring, functional monitoring and business process monitoring. These are shown in the diagram below. These three categories have a very clear hierarchy. Assuming well-configured monitoring, a green light on a higher level indicates that all levels below it are performing well. If there are any red lights on a lower level, this is an indication that there is a low-impact problem. The opposite is not true. A green light on one of the lower levels does not guarantee anything about the performance of the upper levels of monitoring. It merely serves as a guiding light to indicate that a certain subsystem is performing well and is unlikely to be a contributor to a red light on a higher level. Business process monitoring is the holy grail of systems management. All large vendors present their monitoring solution as a business process monitoring tool. If we look at the actual processes in organisations, we find that most of them include operations that are performed by humans, rather than by machines. They include people printing and faxing orders and vans of goods being driven from one place to another. Business process monitors tell us not only whether we can order goods, but also if they are being delivered to our customers. Such monitors keep track of long-running transactions and are happy to report on the proper operation of fax machines and the progress of delivery vans. Business process monitoring answers the questions of whether the business is performing well. The IT systems supporting that business are only a piece in the puzzle to answer that question. I find it odd that most so-called business process monitoring solutions confine themselves to monitoring only technical processes. I hardly ever see monitors that actually track the goods right to the customer’s doorstep. This may be proper if all your processes are fully automated. If not, perhaps you are really working with a functional monitor, and not a business process monitor, in spite of what the salesman told you. Functional monitoring looks at the functionality offered by a single application or by a distributed system. The aim of functional monitoring is to assess the performance and availability of use-case or set of use-cases on a system. Functional monitoring is usually performed by employing robots to execute scripted operations on a system. Robot-based monitoring is excellent for management reports on the quality of service that the users of a system experience. Functional monitoring answers the question whether there is a problem in the distributed system or not. It says something about the performance and availability of the system, but does not help to answer that question of how to solve any problems we may find. Rather it tells us something about the impact on the users of the system, if there is a problem. Technical monitoring concerns itself with the health of individual pieces of equipment or software. It focuses on the function of the object under review, rather than the role that such an object plays in the system that it is part of. 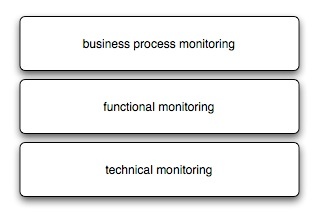 It may be just my skewed viewpoint, but I find that technical monitoring is by far the largest category of the three. Most tools monitoring tools were designed to perform functions in this category of monitoring. Technical monitoring tries to find out what is wrong, and how do we fix it? Many system operators make the mistake of thinking that technical monitoring also answers the question whether there is a problem in their system or not. It is an understandable mistake, because in many cases when there is a problem, it also shows up in the technical monitors. In some cases, however, it does not. And this is when miscommunication is likely to occur.